This Site Waste Management Plan (SWMP) Regulations Guide has been prepared by Envirowise to provide the construction industry with an introduction to the SWMP Regulations 2008.... This Checklist is part of your Site Waste and Recycling Management Plan (SWRMP) and will be assessed against the provisions of WDCP 2012 � Part B1, Waste . This Part of WDCP 2012 must be read before attempting to complete this checklist. The following general site waste management actions will be put into practice to minimise the accumulation / generation of waste on site. 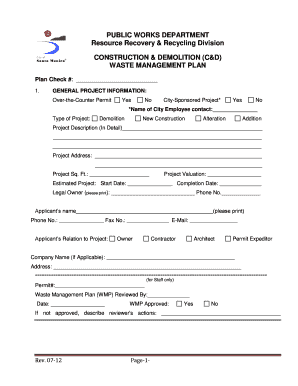 All Company and contract personnel working on site will undergo a site induction.... A Waste Management Plan will be required in cases when the volume of waste likely to be generated, or the constraints of the site and surrounding locality, warrant a coordinated and sustained approach to management. 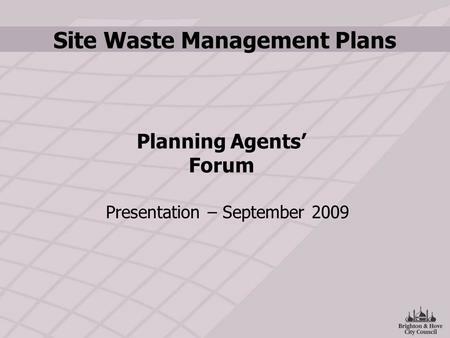 This Checklist is part of your Site Waste and Recycling Management Plan (SWRMP) and will be assessed against the provisions of WDCP 2012 � Part B1, Waste . This Part of WDCP 2012 must be read before attempting to complete this checklist.